we’re lucky to live in a wonderful apartment in an old art-deco era building. it’s unusually big (a one bedroom that’s the size of a typical 2 bedroom), has wooden parquet floors, and is solidly built – so it’s warm in winter and cool in summer. only thing is, the previous owners remodelled the kitchen… in a style that, erm, i kind of HATE. the cupboards are a dark reddish-brown laminate “wood” colour that just isn’t to our taste and the wall tiles (which seem to creep almost up to the ceiling) are a dark, creamy ceramic. the space is especially unsuited to this style, as it doesn’t get a lot of natural light, so it ends up looking even smaller and more cramped than it actually is. in fact it’s not dissimilar to the kitchen in this before feature by Amber Interiors – and the after is almost exactly what i want. so now all i can think about is redoing our kitchen. i’ve even thought of maybe painting our existing cupboards, but i’m afraid of going through the effort of covering dark laminate cupboards with white paint and the result just being crap. anyone have any experience in this arena? if you live in Cape Town and you have any suggestions for great kitchen designers & contractors please let me know in the comments! 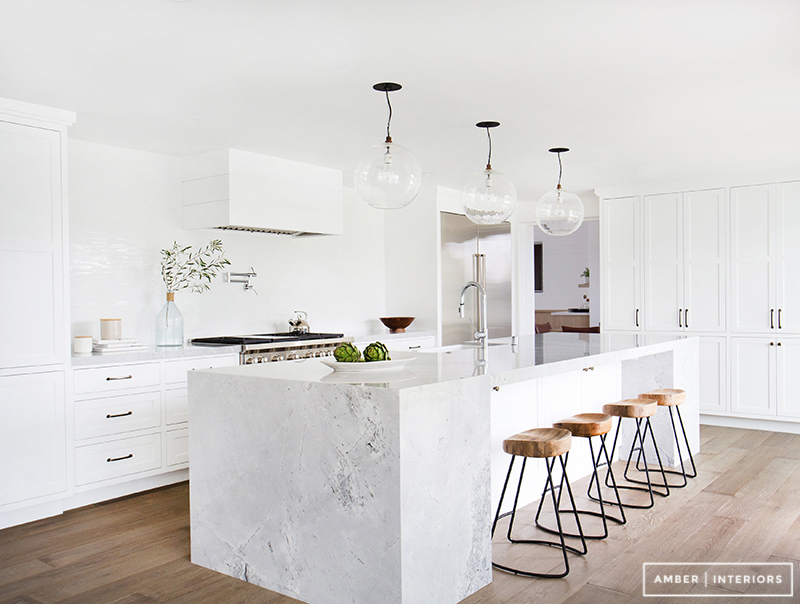 above: this is the kitchen i mentioned from Amber Interiors. what an inspirational before and after! i don’t necessarily want white, white, white – but it does lend itself to a more open feel, doesn’t it? and it complements the wooden floors so well. we have no space for a huge marble-top island, unfortunately. this kitchen is also great. above: i love the open cupboards and the interesting backsplash. another good example of how well white goes with wooden floors. photo by Joe Schmelzer, designed by Kishani Perera. above: looking at Sarah’s kitchen makeover makes me do one of these. the marble, the green cupboards, the gold hardware… wow. her cabin kitchen makeover is also AMAZING. i’m definitely convinced by those open shelves. above: i quite like the idea of stainless steel surfaces, especially in a small kitchen. the Swedes always get it so right. above: and on the other end of the spectrum: wood, wood and more wood. also a proponent for open shelves (as long as you have cool kitchen things to display?) i also like that handles aren’t necessary here. above: i love how well these dark cabinets go with the wooden floors. maybe i can just slather some dark grey or navy paint on our existing laminate cupboards? i think this only works on the bottom cupboards though, you’d need open shelving or white cupboards overhead. kitchen by deVOL. above: this interesting grey backsplash is a nice change from the usual white subway tiles that we are seeing all over the place now. design by Doherty. above: i’m not sure if i’m entirely convinced by black cupboards in our own kitchen, but this combination of black, white and gold is just so cool. let this be an inspiration for you if not for me… photos by Jonas Berg. above: this kinda greeny-grey colour on the cabinets is all sorts of dreamy. also: marble, marble MAAAAAARBLE! (Oprah voice) and, once again, gold hardware.images from Karlavägen 76.
above: look, if i had an unlimited budget i would probably get someone like Fiona Lynch to design the kitchen for me, cause DAAAAAMN. this entire apartment is dreamy. more kitchen, and other interior inspiration, at my Pinterest. The MAAAAARBLE made me laugh (oh how I love Oprah voice). I’d also be quite interested to see if paint over laminate works. I hope another one of the readers comes through with advice! A quick fix that can make a big difference is to remove the doors of the high cupboards, turning them into shelves. It will remove some of the closed , dark feel and let you create of your own mood with your displayable kitchenalia. Also, we had architect Daniel Maggs make us a lovely kitchen while renovating, working with Steven Brooker on cabinets that still look awesome 7 years later. Versveldt also does impeccible work. Good luck! We are using these guys, they are a pleasure to work with and quite affordable and understand the more modern finishes. there is also no charge to discuss things with their designer. Hello, A few cautionary notes. Tile in bath or kitchen is difficult to clean, very time consuming. 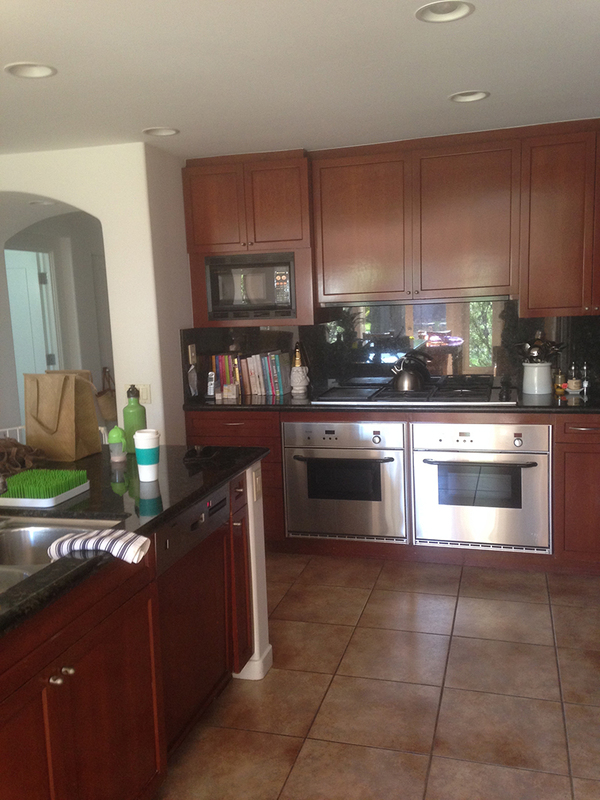 I have had both small and large kitchens (with island) and, by far, small kitchens are much more efficient. By the time you walk around the island for the 800th time, you wonder why it has to be there. Good luck in remodeling. Ugh yes. I have been drooling over Sarah’s (Smitten Studio) makeover for a while, and that warm wooden kitchen with all the beautiful natural light and recessed handles. So good. They make my own kitchen renovation seem further away yet more pressing than ever! Also, love the cast concrete island in that huge white kitchen. Hi! Sorry – I am a bit late to reply (only saw this post now). We had those very gross cherry wood laminate cupboards in our kitchen – I hated it. In April, over the long weekend, we decided to paint it! As we had literally no budget and it was very spur of the moment – we went to the closest paint shop. They gave us an undercoat (super cheap) and recommended we paint the cupboards with a good quality oil based paint (I think we went for Dulux kitchen & bathroom) and a tint of our wall colour (not plain white), which is a light warm greyish colour. It is a 25% of the colour, it looks white (what I wanted), and it looks great! It blends so well with the walls in any light and it still looks soft and welcoming. We applied one coat of the undercoat (everything with a soft roller, much smoother than a brush) and had to do 3 coats of paint! It was hard work, sore backs and a lot of waiting ;) but so worth it! We also painted the tiles with the same undercoat and paint – it worked super well! aaaah you are amazing, thanks so much!!! i might have to give it a try soon! I have just started looking around myself for someone to do a lovely kitchen space in a loft I am moving into in Woodstock. Both exciting and daunting. I want to make it a Baker’s Paradise. Was wondering if you ever came across some great counter/kitchen builder’s in your search last year? 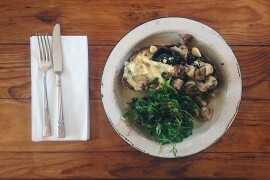 I have now spent the past hour scrolling through this beautiful blog, and I am obsessed! Everything I have seen matches my style, and has made me desperate to buy and decorate a house! it’s easy to get a mortgage… right?